Born in 1972, he lives in St-Nazaire in France. After few years as a saxophone-player in various jazz band, Christophe Havard moves towards sound experimentation and listening of our environment. 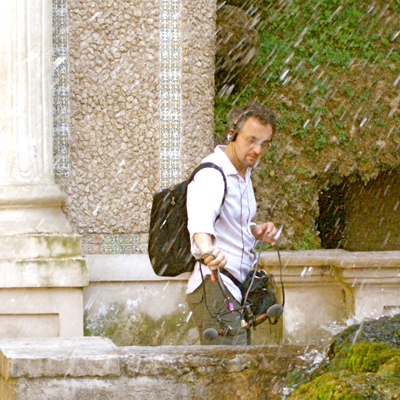 Now, he realizes sound installations, electro-acoustic music, he's invited in residency about sonic environments, he plays in several improvisation groups, he composes music for theater and documentary cinema, manages the association Volume/collectif and he teaches music in different contexts (music school, national education, art museum). "Immensity of the territory" by abs(. )hum at the festival Farniente from christophe havard on Vimeo. He played with: Tim Berne, Keith Rowe, Taku Sugimoto, AMM, John White, the Kristoff K.Roll, Hughes Germain, Yannick Dauby, Domenico Sciajno, Jérome Noetinger, Jérome Joy, Laurent Dailleau, Steve Potts, Baptiste Trotignon, Annette Krebs, Andrea Neumann, Geoffroy Tamisier, Alban Darche... He's regularly invited to perform in Europe (France, Belgium, Germany, Netherlands, Switzerland) and in the United States. "Immensity of the territory #2 : the Southwest" Presentation of the project by abs(. )hum from christophe havard on Vimeo.